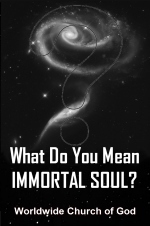 What Do You Mean... IMMORTAL SOUL? Where did the idea of an "immortal soul" come from? The Bible? The ka was said to be a spirit replica of a man, containing the "vital force" given to him at birth. At death, the ka was believed to take up residence in a statue or picture of the deceased. The statue or picture was placed in the tomb for that very purpose. As the tomb was to be the eternal home of the ka, it was provided with everything the ka would need for a happy afterlife — food, furniture, games, reading material, grooming aids and the like. The other soul, the ba, was held to be that part of man that enjoyed an eternal existence in heaven. It was believed to fly from the body with the last breath. The ba was often depicted on tomb paintings as a human-headed hawk hovering over the deceased's body. The ancient Egyptians believed the ba occasionally came back to "visit" the body in the tomb and to partake of the food and drink offerings there. "The Egyptians were the first that asserted that the soul of man is immortal.... This opinion some among the Greeks have at different periods of time adopted as their own" (from Euterpe, the second book of Herodotus' History). The pre-Socratic Greek philosophers had no real conception of any nonmaterial element in man. The philosophers Socrates and Pythagoras were among the first of the Greeks to adopt the Egyptian view. They subsequently had a great influence on the thought of Plato. It was Plato who popularized the immortal soul concept throughout the Greek world. Socrates' statement is little different from the teaching of most churches today! "The soul whose inseparable attitude is life will never admit of life's opposite, death. Thus the soul is shown to be immortal, and since immortal, indestructible.... Do we believe there is such a thing as death? To be sure. And is this anything but the separation of the soul and body? And being dead is the attainment of this separation, when the soul exists in herself and separate from the body, and the body is parted from the soul. That is death... Death is merely the separation of the soul and body." "The belief that the soul continues its existence after the dissolution of the body is... nowhere expressly taught in Holy Scripture.... The belief in the immortality of the soul came to the Jews from contact with Greek thought and chiefly through the philosophy of Plato, its principal exponent, who was led to it through Orphic and Eleusinian mysteries in which Babylonian and Egyptian views were strangely blended" (The Jewish Encyclopedia, article, "Immortality of the Soul"). Many of you will undoubtedly be surprised to discover that the idea of the immortality of the soul was not derived by the Jews from the Old Testament scriptures, but rather taken from Plato! Tertullian (A.D. 155-220), for example, wrote: "For some things are known even by nature: the immortality of the soul, for instance, is held by many... I may use, therefore, the opinion of a Plato, when he declares: 'Every soul is immortal' " (The Ante-Nicene Fathers, Vol. III). Augustine of Hippo (A.D. 354-430) — held to be the greatest thinker of Christian antiquity — also taught the immaterial and spiritual nature of the human soul. But notice the source of his teachings. The Encyclopedia Britannica admits: "He [Augustine] fused the religion of the New Testament with the Platonic tradition of Greek philosophy." "It is probable, in my opinion, that, with very few exceptions, indeed, the dead sleep in utter insensibility till the day of judgment.... On what authority can it be said that the souls of the dead may not sleep... in the same way that the living pass in profound slumber the interval between their down-lying at night and their uprising in the morning?" "Traditional Western philosophy, starting with the ancient Greeks... shaped the basic Western concepts of the soul." Consider first the teaching of the Old Testament. As we have seen, the Jews living in the Hellenistic world admit they took the immortal soul doctrine from Plato. Why? Because it is nowhere found in the Hebrew Scriptures! The Hebrew language further proves this point. The Hebrew word translated as "soul" in Genesis 2:7 in the widely used King James Version of the Bible is nephesh. Nephesh designates temporary physical life. It means a living, breathing creature. This is the same word used frequently in the first chapter of Genesis and elsewhere in reference to animals. In Leviticus 21:11, Numbers 6:6, Haggai 2:13 and elsewhere, the word nephesh is even used with reference to a dead body! Nephesh clearly has nothing whatsoever to do with any sort of spirit essence. The soul is not a sepa rate entity from the body. It is the body! Man is a nephesh. He is a soul! No wonder Jewish scholars today have to point to Plato as the origin of the immortal soul doctrine! What about the New Testament? Surely here we find biblical proof for an immortal soul. Or do we? In the New Testament, "soul" is a translation of the Greek word psuche. Psuche is the equivalent of the Hebrew word nephesh. Like nephesh, psuche is frequently rendered "life" in addition to "soul." Psuche is twice used in the New Testament for the lower animals, exactly in the same way as the Hebrew nephesh can refer to the life of animals. In these two scriptures (Rev. 8:9 and 16:3), psuche is rendered "life" and "soul' respectively, with reference to the life of sea creatures. As Jesus clearly stated: "That which is born of the flesh is flesh; and that which is born of the Spirit is spirit" (John 3:6). Man — born of the flesh — is flesh. He was not created with inherent immortality. He has only a temporary physiochemical existence. "For dust thou art, and unto dust shalt thou return," God told Adam (Gen. 3:19). Since man's material "soul" — his body and its physical life processes — are corruptible and perish after death, how is it possible for God to ultimately resurrect an individual? If everything is physical and turns to dust, what is there that remains of a person to be "brought back"? How are his personality, his memory, and his character preserved by God until a day of resurrection? The answer is simply that not everything about a man is physical! The Bible calls this nonphysical component the "spirit [Hebrew ruach, Greek pneuma] in man" (Job 32:8; Zech. 12:1; I Cor. 2:11). It is not the man. It is in man. This spirit in man, however, has no consciousness apart from the physical human brain. It is not to be confused in any way with the fictional concept of a conscious "immortal soul." "The dead know not anything," the Bible declares (Eccl. 9:5, 10). In the day of a man's death, "his thoughts perish" (Ps. 146:4). The Bible clearly pictures death as a sleep — a state of unconsciousness (Dan. 12:2). At death, this spirit in man "shall return unto God who gave it" (Eccl. 12:7). It is then "filed away," so to speak, like a tape recording for God's future use at a resurrection. Throughout the centuries of professing Christianity, innumerable sermons have been preached and countless pamphlets written supposedly "proving" the soul's immortality. Upon careful and open-minded examination, they are all found riddled with gross error and misrepresentation! The doctrine of the immortal soul is built on a foundation of biblical mistranslations, false premises, sloppy scholarship and even outright dishonesty. Few ministers and laymen have had the spiritual courage to take a fresh, unprejudiced look at the question and accept the true Bible teaching. Satan the devil has succeeded — for the time being — in deceiving the whole world (Rev. 12:9). It was he who first introduced the idea that man does not really die, but is inherently immortal. "Ye shall not surely die;" Satan lied to Eve in the Garden of Eden (Gen. 3:4). Write for our booklets What Will You Be Doing in the Next Life?, What is the Reward of the Saved? and The Wonderful World Tomorrow — What It Will Be Like? It is time to cast off the fables and traditions of men and understand the great meaning and purpose of human life as revealed in the Bible!